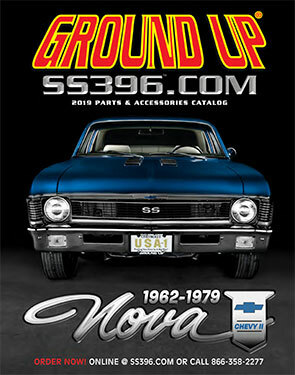 The 2019 Chevy Nova parts catalog is available now! Our Nova Auto Parts Mail Catalog is also available via our online Nova Part Catalog Store. It’s free! All you need is Adobe Acrobat Reader (it’s free). If you don’t have Adobe Acrobat you can download your free copy by clicking here. Get your free copy of the Nova Parts Catalog today! The 2019 Nova Parts PDF print catalog now supersedes all previous catalogs and reflects pricing at time of print. Please be advised that due to the nature of the industry and changing costs of raw materials, prices in this PDF print catalog are subject to change without notice. Please call our sales department at 866-358-2277 or email info@ss396.com with any questions.